A signed copy of the Beatles' album Sgt. Pepper's Lonely Hearts Club Band sold at auction for $290,500 on Saturday. The final sale price far exceeded the $30,000 originally estimated for the item and broke the previous record for similar sales. 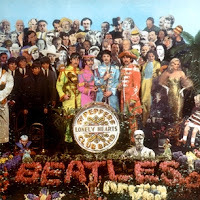 The U.K. Parlophone copy of the album, with high gloss cover and gatefold, was autographed by all four Beatles in 1967, the year the album was issued. Bidding on the album began at $15,000. Early bidding had already pushed the price past $110,000 a week before the auction date, and the number just kept climbing. Gary Shrum, consignment director of Dallas-based Heritage Auctions, which ran the sale, said that the bidding had "taken on a life of its own," perhaps because of the particularly high quality of the autograph. According to the Hollywood Reporter, the album was purchased by an unnamed buyer from the Midwest. The previous record price for a signed Beatles album cover was $150,000, which bought a copy of the band's 1964 album Meet the Beatles.